Max Holloway was spectacular in his first UFC fight at 155 pounds, but Dana White isn’t sure he wants to see that sight again anytime soon. At the UFC 236 post-fight presser, White heaped praise upon Holloway and Dustin Poirier for delivering five rounds of non-stop action in Saturday’s main event at State Farm Arena in Atlanta, then addressed the question of whether he expects to see Holloway drop back down to 145 pounds to defend that division’s title. Holloway lost a unanimous decision to Poirier, a result that prevented him from adding an interim lightweight title to his collection. But as featherweight champion, he has been unstoppable, winning his previous 13 bouts (including one catchweight affair) dating back to January 2014. It’s that run that has White confident that featherweight is what’s right for Holloway, even given his spirited effort at UFC 236. “Max Holloway is so tough and such a dog,” White said. “It looked like he was out in the first round, it ends up being a five-round fight, back and forth, amazing, incredible fight. The idea of Holloway making a permanent move up to lightweight is not a new one. At 5-foot-11, he’s always been one of the taller fighters at 145 pounds, and last April he was called in to fight Khabib Nurmagomedov on short-notice for a vacant lightweight championship in Brooklyn. That bout was subsequently canceled due to the New York State Athletic Commission ruling that he didn’t have enough time to safely cut weight. Holloway instead went on to defend his featherweight title against Brian Ortega at UFC 231. 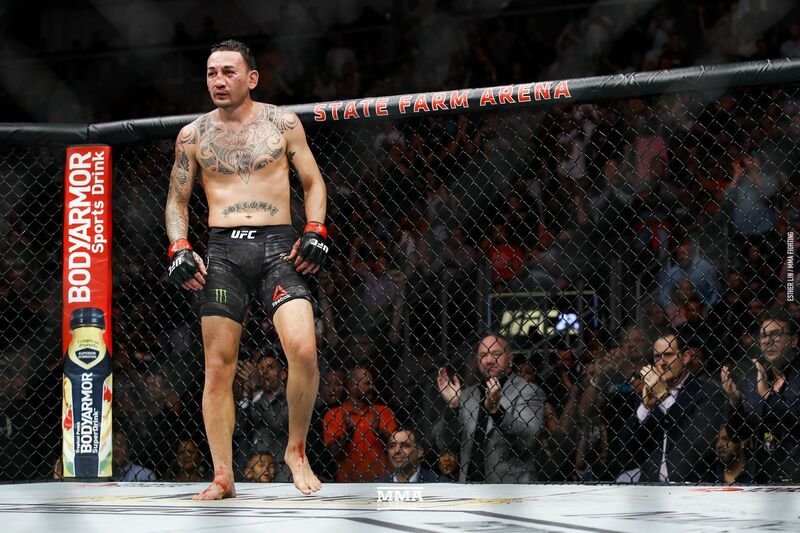 He thoroughly beat down Ortega, leaving the door open for Holloway to explore other options while waiting for the next contender to emerge. That led to him being booked to fight Poirier at UFC 236 for an interim title with undisputed lightweight champion Khabib Nurmagomedov serving out a suspension for his involvement in the UFC 229 melee. Due to potential injuries from the Poirier fight, Holloway was not on-hand to answer questions at Saturday’s post-fight presser. White made it clear that if the featherweight champ plans to go through a war like that again, it will be in his own weight class. “We took him straight from the Octagon to the hospital, that’s why he’s not — I told my guys I don’t want him doing any interviews or anything. Take him straight to the hospital.